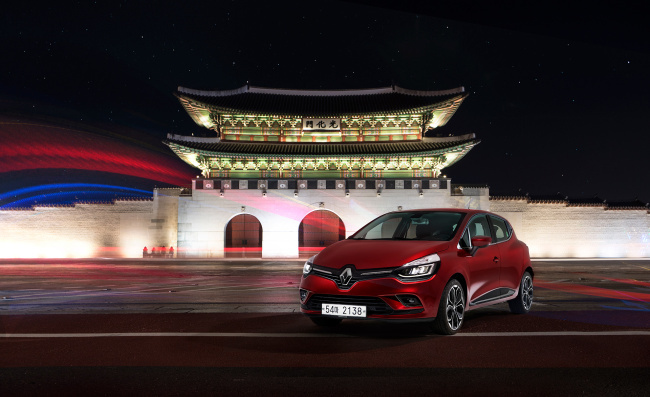 In an attempt to highlight Clio’s French heritage, Renault Samsung, the French carmaker’s South Korean subsidiary, has decided to use the Renault marque for the hatchback’s sales here. Instead of using Renault Samsung’s “storm-eye” badge, the carmaker has attached Renault’s diamond emblem to the Clio, the company said. It means that the carmaker wants to promote Renault as an independent brand, and also that Clio is a compact vehicle that evolved for a long period of time, it explained. Clio is the second car that the carmaker is promoting under the Renault badge. Twizy, an ultracompact electric vehicle, debuted last year solely as part of the Renault brand. Nearly 700 units were sold, demonstrating growing interest in personal mobility, the company said. Clio, which debuted in 1990, is Renault’s best-selling car, with around 14 million units sold around the world. Considered the “textbook” hatchback, Clio sells more than 300,000 units in Europe each year. For Korean customers, the company has added luxury elements such as light-emitting diode head lamps, a Bose premium sound system and forward collision warning system to Clio. The imported vehicle is also entitled to after-services care from a network of 470 outlets across the country.